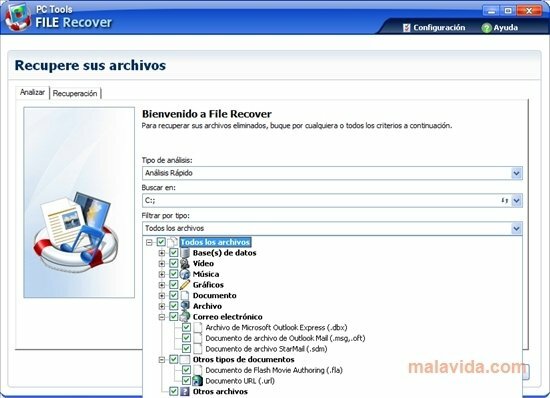 File Recover is a simple tool that analyzes your computer in search of files that have been eliminated from the system, to be able to recover them. 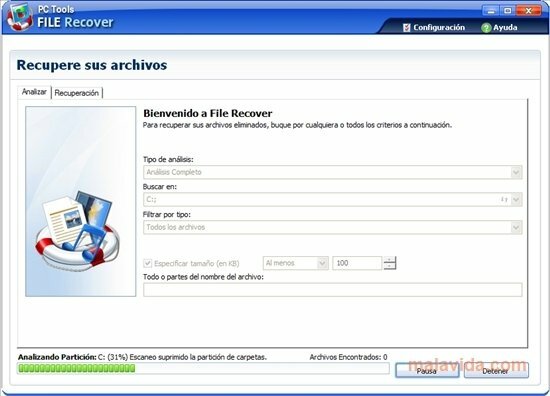 If you have eliminate any document that you thought that you weren't going to need and you want to recover it, File Recover can do it. How it works is very simple and you won't have any problems. To start off, you have to select the kind of analysis that you want to perform. You have to choose between quick, complete and physical analysis. After that you will have to select the unit, and if you want to filter the search depending on the kind of file, in other words, to search only for video, audio, graphic,... files. After that, PC Tools File Recovery will analyze your computer and locate the deleted files. File Recover will show a list with all the files that it has found. After that you will only have to choose those that you want to recover. File Recover will save them in the folder that you indicate, and they will be ready to be used once again. Easily recover all your deleted documents with File Recover. The trial version has limited functions.